Yesterday, the wife and kid took off for the afternoon, leaving me to my own devices on a warm Father’s Day. 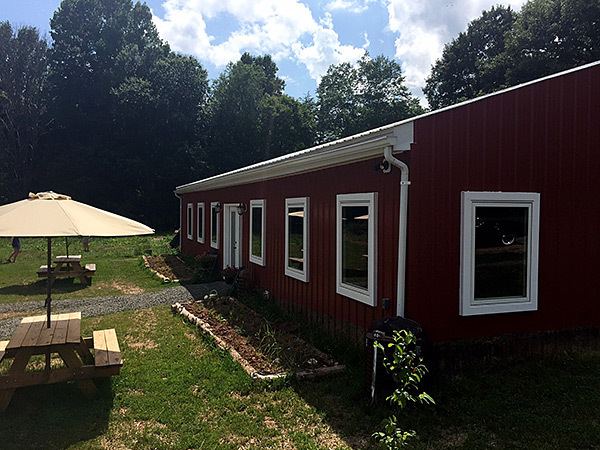 After an excellent lunch with my own father, I headed off to Powers Farm & Brewery, a small, local establishment just East of downtown Warrenton, VA that opened June 4th. There used to be a time when I knew almost everything that was going on in Virginia beer, but that was when you could count all the state’s breweries on two hands. 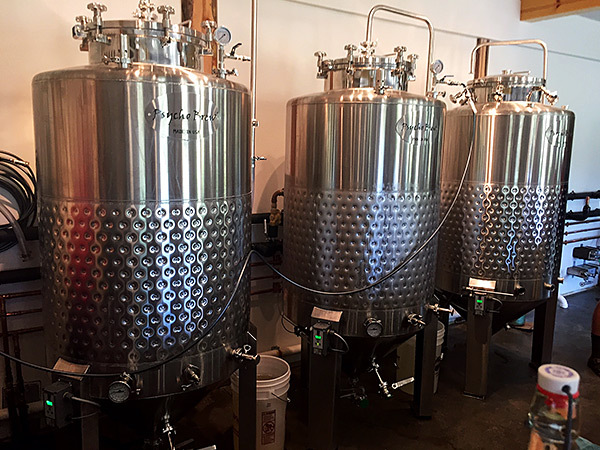 Now, there are over 200 brewing companies and, as a result, I was completely unaware of this farm brewery — that is, until owner/founder/brewer Kevin Powers wrote me late last week inviting me to stop by. 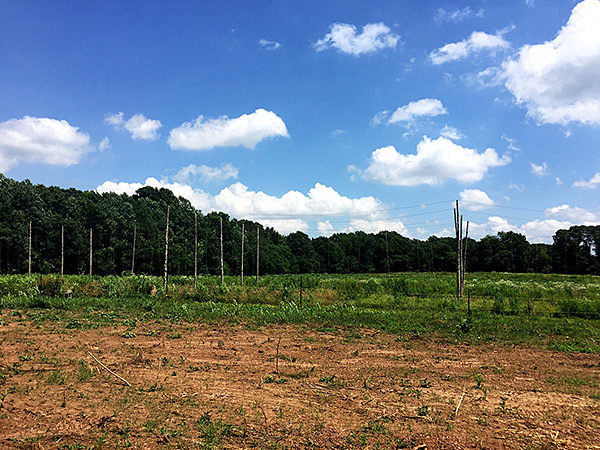 Around since roughly 2012, the farm has been supplying local companies not just with fresh crops but a variety of hops grown on their grounds. Last year’s Old Bust Head’s Harvest Ale featured many of the farm’s hops. For 2017, Kevin and his wife, Melody, have planted Helena, Chinook, Zeus, Cascade and Nugget in preparation for this Autumn’s harvest. Those, along with a myriad of produce and ingredients are employed in varying degree in each of the company’s beers. The tasting room is small, yet inviting accommodating several tables and small bar — with additional seating outside with great views of the fields and hop bines. Once inside, the small structure has a friendly, neighborhood feel as everyone on staff (including Liz, a familiar face from Norm’s Beer and Wine) greets you warmly. A seat at the bar allows you an opportunity to check out the small, but capable brew system and beer board. I settled down at the bar and, looking over the beer list, was happy to see that of the seven offering on tap, only two exceeded 6% ABV. I found that refreshing as many of the “standard” beers on store shelves lately seem to start at 6.5% ABV or more. 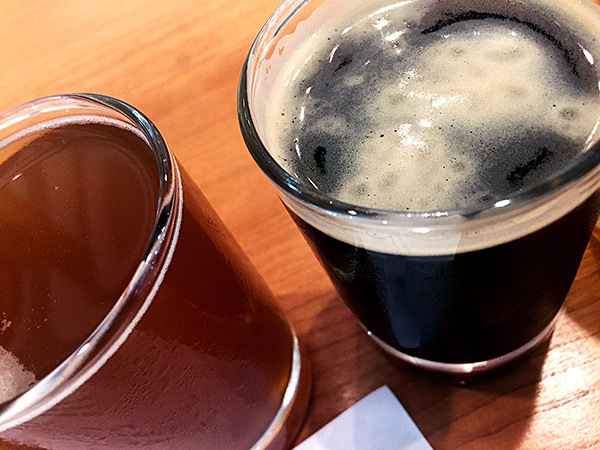 A couple of beers were suggested to help refresh from the heat outside, but I opted for the full flight — I wanted to check out everything at least once before I came back for a single pint (or two) on my next visit. First up was the Lemongrass Pils, a 5% ABV little brew that was out-of-this-world refreshing. I love that ingredients from right outside the front door of the tasting room are in each and every beer on tap. The lemony citrus and earthy nature of the lemongrass added a welcome change of pace from your standard pilsner. And at the lower alcohol content, this one was down right crushable. I can see growlers of this one disappearing quickly at Barley Blog HQ. 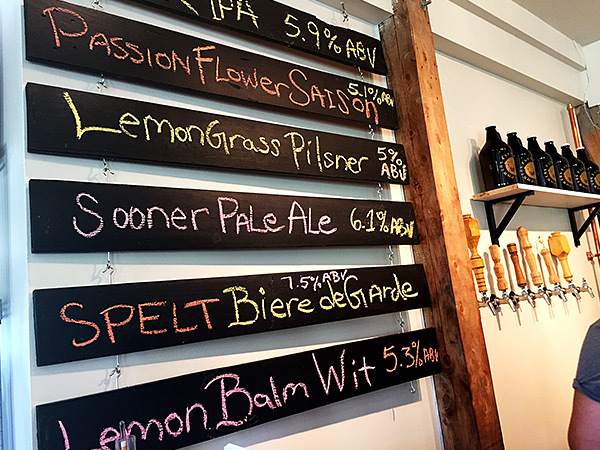 Passion Flower Saison (5.1% ABV) carried a yeasty character with light floral traits and lingering honey. The lightly crisp beer was refreshing with a lasting, gentle hop bitterness. Sooner Pale Ale (6.1% ABV) is named for Kevin’s home state and sits in the glass with an unfiltered presentation. A solid caramel backbone is balanced nicely with an earthy hop bite, making for an approachable and clean experience. This particular recipe was the firs to be brewed on the company’s system. Powers’ Black IPA (5.9% ABV) is a darn good example of the style. It’s rich and roasty with a lasting black coffee character that goes well with the hop bite, eventually fading to a lightly drying and lasting finish. It’s well balanced and would work really well in the colder months, as well. Lemon Balm Wit (5.3% ABV) is not your standard take on a witbier. It, much to my pleasure, lacks the typical banana yeastiness that persists among many in this realm. This one has a lovely lemon zest trait that adds to the beer’s already refreshing nature. Before I had left for the brewery, I took a look at their website and the one beer that truly caught my eye was the 7.5% ABV Spelt Biere de Garde. It’s not often that you run across a brew that uses spelt, so my interest was piqued immediately. And this medium brown hued beauty of a beer more than lived up to expectations. It’s yeasty, rustic and full flavored as grain, caramel and a soft funk all linger together wonderfully. Even with the higher alcohol content, this one was incredibly refreshing. The one beer that wasn’t listed on the brewery’s beer board was a fresh batch of their Session Pale Ale which, at ~5% ABV, really isn’t sessionable, but I won’t complain too much as I did enjoy its earthy hoppiness. The hazy brew has a nice grain, bread backbone to support a light-to-moderate hop bite that hung around with lemon citrus and grapefruit notes. All in all, I had a great visit with Kevin and Melody at their newly launched Powers Farm & Brewery. Had I not had other things to tackled later yesterday afternoon, I could have sat at that bar the remainder of the day. Having a welcoming and enthusiastic atmosphere is great, but having equally tasty and well-crafted beer only sweetened the pot. 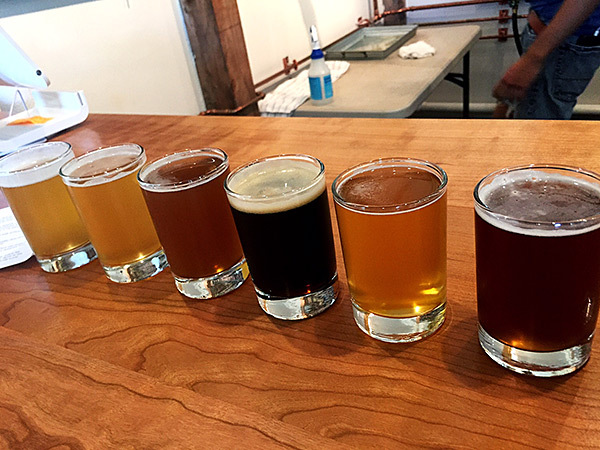 If you’re in the area and looking for something a bit different than your standard brews, be sure to check out this latest Virginia brewery. 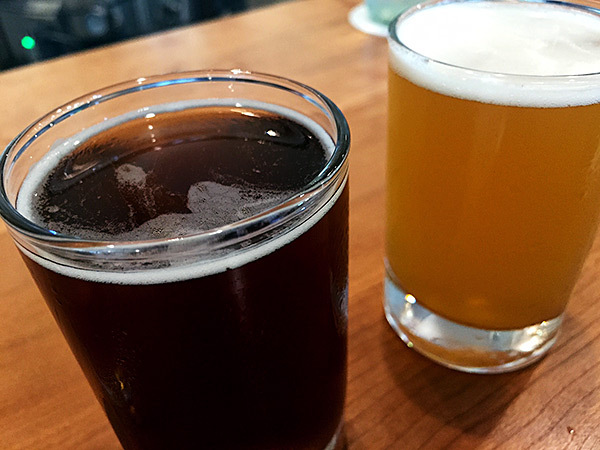 Share "A Visit to Powers Farm & Brewery"